Today I'm so excited to share with my Fireman Party theme favors! I love planning my son's birthday parties but the loot bags are my favorite part. There's a special spot in my heart for the art of gifting. When designing loot bags or picking a present, the packaging is always so important to me. It sets the tone. It brings everything together. So he's the background...when my son turned 3 this year, we made him a fireman party. 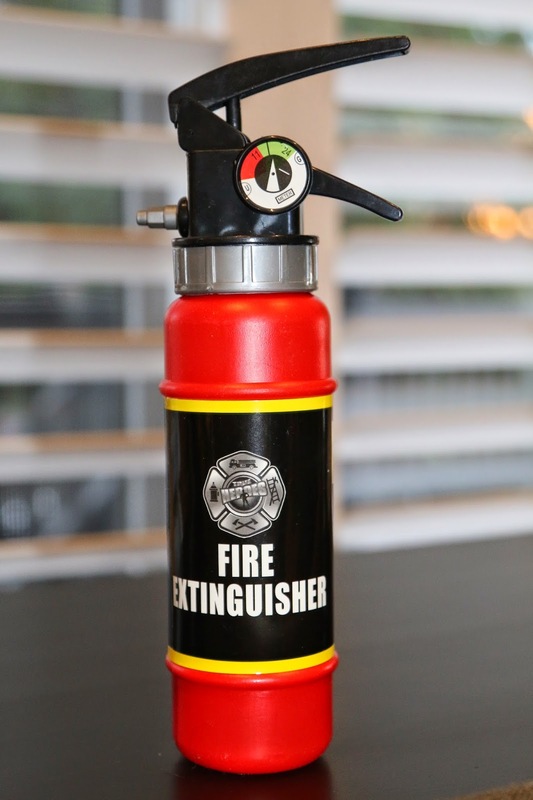 When researching everything firefighter, I found this toy fire extinguisher from MyPartySuppliesDelivered.com. It fit perfectly with the fireman party theme and it got me thinking. On it's own it wasn't enough to complete the loot bag. But my son does LOVE fire extinguishers (in all honestly, he doesn't just love them, he's bordering on obsession). So then I got to thinking about all the tools that a firefighter needs and B-I-N-G-O, I had it. 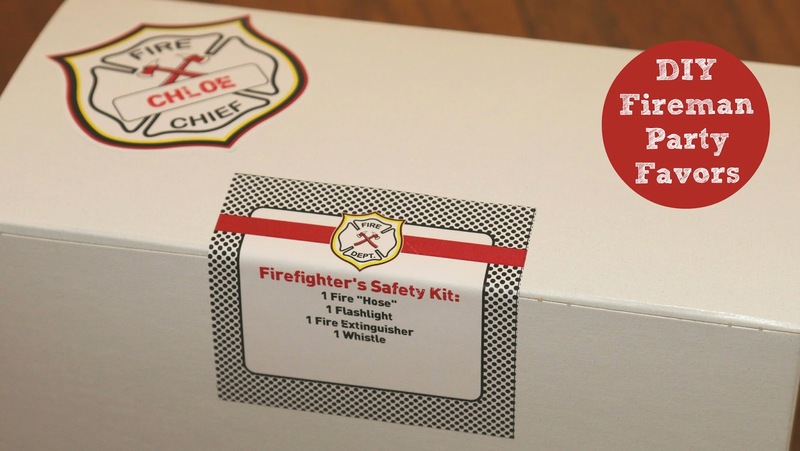 It was time for a kit, a fireman's safety kit to be precise. In terms of packaging, I found a box that fit the fire extinguisher just perfectly. I couldn't get my hands on the red version in time for the party so I settled for white. To some it may seem insignificant (like to my husband) but for me it meant I was settling. To bring the kit feeling to the packaging, I created a seal for the box and listed the contents of the kit. 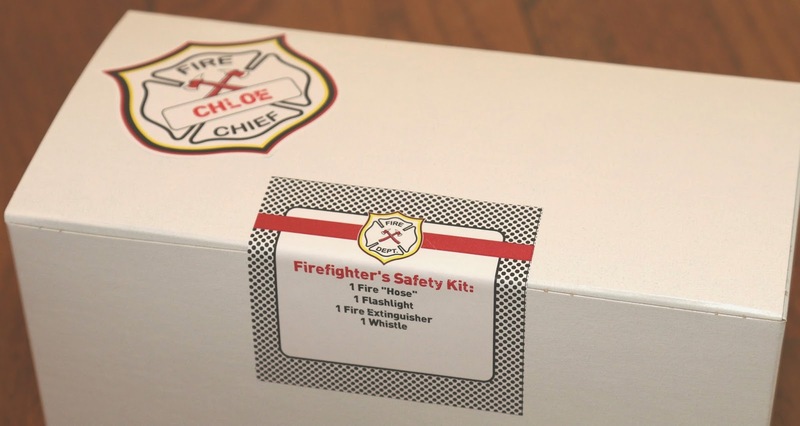 I then personalized each package with the child's name on a Fire Chief badge. I created both labels using the editable Fireman theme Birthday Party collection that we purchased from SIMONEmadeit. I simply printed them on full sheet labels and cut them to size. On the inside, I used the gift tag editable Fireman theme Birthday Party collection and printed it on full sheet labels as well. Aside from the color or the box, I am really happy with how it turned out. Most importantly, my son and his friends seemed to love it! What loot bags did you give out at your firefighter birthday party? Please share by posting a comment below. I'd love to her your ideas.